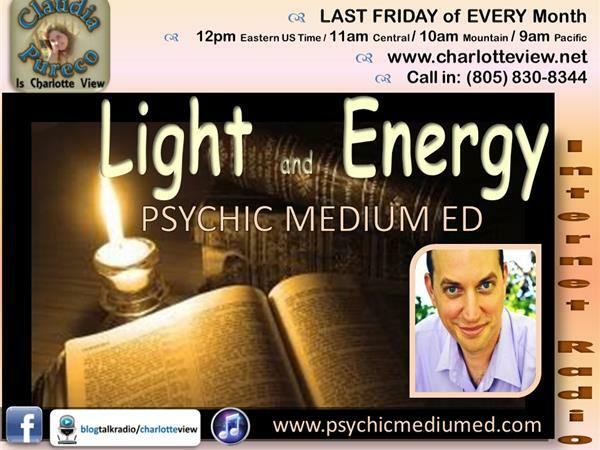 Charlotte View and Psychic Medium Ed present Light and Energy Show ~ a show that helps callers understand their own psychic abilities and get clarity on how to use them. The last Friday of every month call for a FREE reading at (805) 830-8344. Want to make sure your number is picked? Use #TAKEMYCALL For only $11.00 jump the long list of callers and talk with Ed. We all have situations in life that happen, that may throw us off balance, Spirit wants to help. That is where Psychic Medium Ed comes in. He has extensive research, training, classes, and seminars through many places including his certification at Delphi University.